A charge of £60 pounds for building and assembly per trailer. All Trailers we build will be supplied with a Certificate of Conformity. with a delivery charge of £85. Please watch for our special offers throughout the year. Thank you for browsing our stock. Please contact us re-availability of model of Trailer you require. 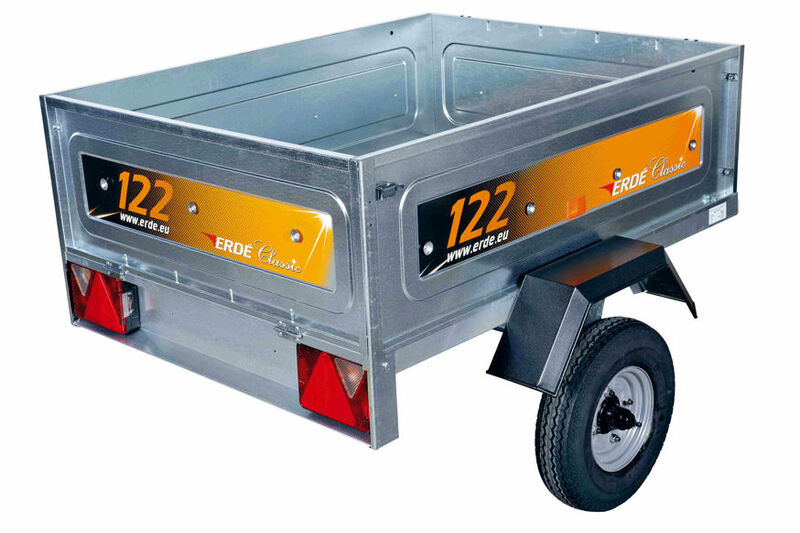 The Erdé 122.2 Classic Trailer is one of the most popular trailers in the Erdé range and is perfect for use as a camping trailer and carrying garden waste etc. It is constructed from galvanised steel for strength and to protect against corrosion, extending the life of the trailer. The Erdé 122.2 is capable of carrying a net load weight of 335kg and is fitted with torsion suspension to improve the ride. The trailer also features a tipping mechanism and a removeable tailgate, making loading and unloading far easier, especially with bulk materials such as earth, sand and gravel. Recessed light clusters, a feature on all Erdé trailers allow for a high level of protection against damage and on the smaller models of trailer such as the 122.2 allow the trailer to be stored vertically on its end. This significantly reduces the area required to store the trailer when not in use. As with all Erdé trailers the 122.2 Classic box trailer meets and exceeds the new type approval legislation being enforced as of October 2012. As a result each trailer produced to these standards has to be supplied with a Certificate of Conformity, an example of this certificate is included with the trailer images above. 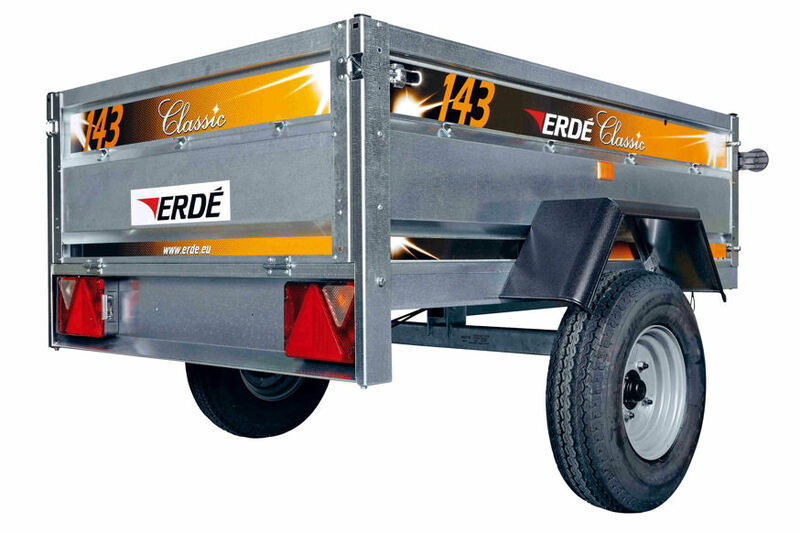 The Erdé 143.2 Classic Trailer is the first Erdé trailer to have folded side panels and corner posts, this allows for a much wider range of accessories to be fitted to the 143.2 trailer, compare to the smaller trailers in the range. 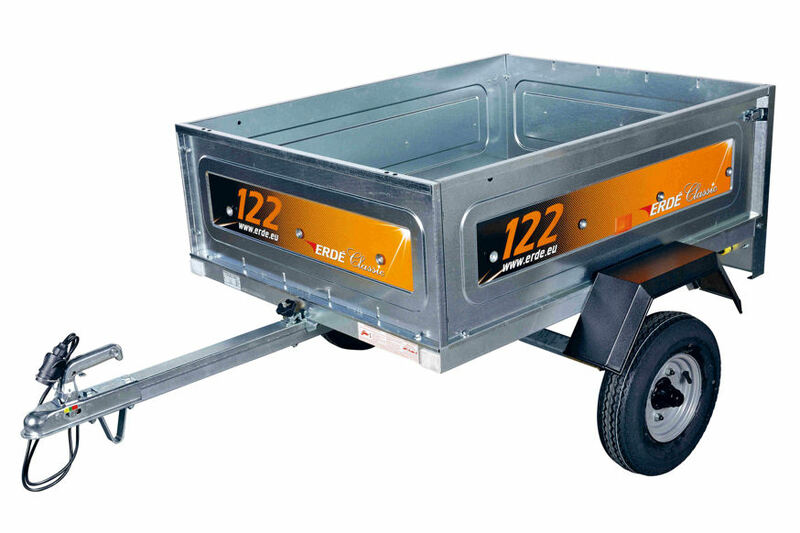 Having slightly higher sides than the Erdé 142 means it is still ideal for use as a camping trailer and carrying garden waste etc. It is constructed from galvanised steel for strength and to protect against corrosion, extending the life of the trailer. The Erdé 143.2 is capable of carrying a net load weight of 502kg and is fitted with torsion suspension to improve the ride. The trailer also features a tipping mechanism and a removeable tailgate, making loading and unloading far easier, especially with bulk materials such as earth, sand and gravel. Recessed light clusters, a feature on all Erdé trailers allow for a high level of protection against damage and on the smaller models of trailer such as the 143.2 allow the trailer to be stored vertically on its end. This significantly reduces the area required to store the trailer when not in use. As with all Erdé trailers the 143.2 box trailer meets and exceeds the new type approval legislation being enforced as of October 2012. As a result each trailer produced to these standards has to be supplied with a Certificate of Conformity, an example of this certificate is included with the trailer images above. The Erdé 153.4 Classic Trailer is the first of the Erdé light commercial trailers and is fitted with an ‘A’ frame drawbar for added strength, this trailer has been designed with regular use in mind. It is constructed from galvanised steel for strength and to protect against corrosion, extending the life of the trailer. The Erdé 153.4 is capable of carrying a net load weight of 526kg and is fitted with torsion suspension to improve the ride. The trailer also features a tipping mechanism and a removeable tailgate, making loading and unloading far easier, especially with bulk materials such as earth, sand and gravel. Recessed light clusters, a feature on all Erdé trailers allow for a high level of protection against damage and on the smaller models of trailer such as the 153.4 allow the trailer to be stored vertically on its end. This significantly reduces the area required to store the trailer when not in use. As with all Erdé trailers the 153.4 box trailer meets and exceeds the new type approval legislation being enforced as of October 2012. As a result each trailer produced to these standards has to be supplied with a Certificate of Conformity, an example of this certificate is included with the trailer images above. The Erdé 163.4 Classic Trailer is a light commercial trailers and is fitted with an ‘A’ frame drawbar for added strength, this trailer has been designed with regular use in mind. It is constructed from galvanised steel for strength and to protect against corrosion, extending the life of the trailer. The Erdé 163.4 is capable of carrying a net load weight of 600kg and is fitted with torsion suspension to improve the ride. As with all Erdé trailers the 163.4 box trailer meets and exceeds the new type approval legislation being enforced as of October 2012. As a result each trailer produced to these standards has to be supplied with a Certificate of Conformity, an example of this certificate is included with the trailer images above. 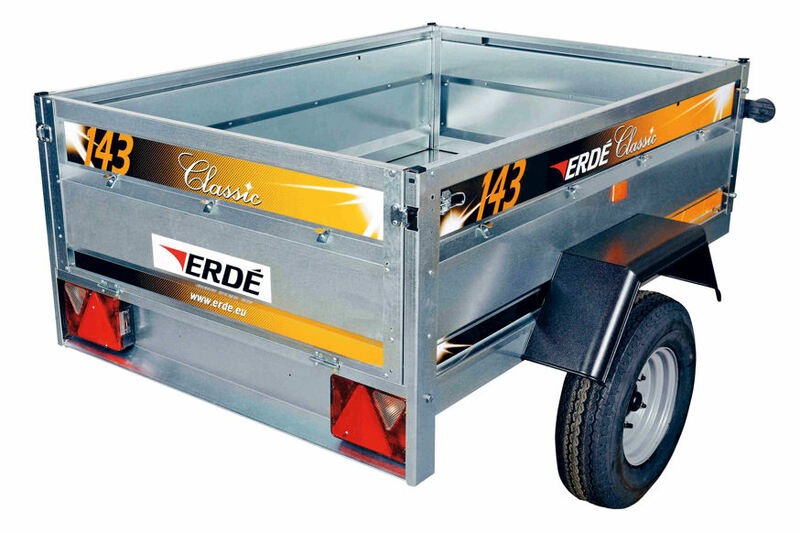 The Erdé 193.4 Classic Trailer is a light commercial trailers and is fitted with an ‘A’ frame drawbar for added strength, this trailer has been designed with regular use in mind. It is constructed from galvanised steel for strength and to protect against corrosion, extending the life of the trailer. The Erdé 193.4 is capable of carrying a net load weight of 600kg and is fitted with torsion suspension to improve the ride. As with all Erdé trailers the 193.4 box trailer meets and exceeds the new type approval legislation being enforced as of October 2012. As a result each trailer produced to these standards has to be supplied with a Certificate of Conformity, an example of this certificate is included with the trailer images above. 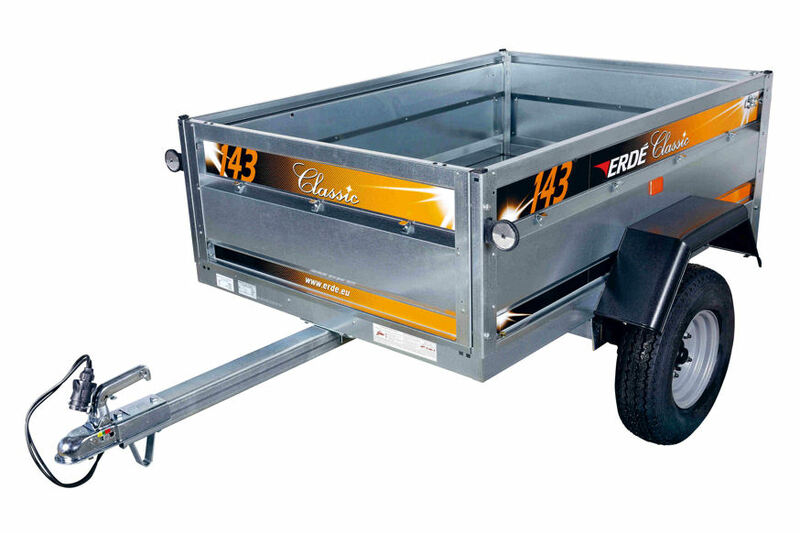 The Erdé 233.4 Classic Trailer is the unbraked, single axle version of the Erdé heavy duty trailers and is fitted with a reinforced ‘A’ frame drawbar for added strength, this trailer has been designed with regular heavy duty use in mind. It is constructed from galvanised steel for strength and to protect against corrosion, extending the life of the trailer. The Erdé 233.4 is capable of carrying a net load weight of 529kg and is fitted with torsion suspension to improve the ride. As with all Erdé trailers the 234.4 box trailer meets and exceeds the new type approval legislation being enforced as of October 2012. As a result each trailer produced to these standards has to be supplied with a Certificate of Conformity, an example of this certificate is included with the trailer images above. The Erdé 234×4.4 Braked Classic Trailer is the top of the range, braked twin axle version of the Erdé heavy duty trailers and is fitted with a reinforced ‘A’ frame drawbar for added strength, this trailer has been designed with regular heavy duty use in mind. It is constructed from galvanised steel for strength and to protect against corrosion, extending the life of the trailer. The Erdé 234×4.4 Braked is capable of carrying a net load weight of 1196kg and is fitted with torsion suspension to improve the ride. As with all Erdé trailers the 234×4.4 Braked box trailer meets and exceeds the new type approval legislation being enforced as of October 2012. As a result each trailer produced to these standards has to be supplied with a Certificate of Conformity, an example of this certificate is included with the trailer images above.